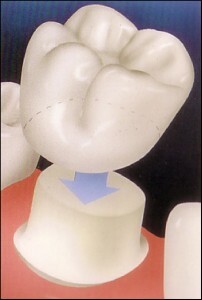 A crown (often known as a ‘cap’ to patients) is a tooth shaped restoration that is placed over a prepared tooth. It is mainly used to restore a natural tooth’s shape, size and also to improve the appearance of your smile. There are different types of tooth-coloured crowns available, some even included under NHS treatment. 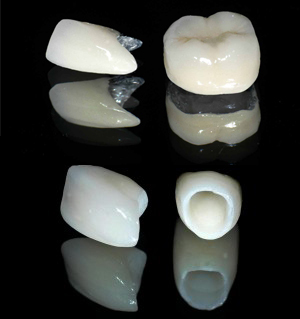 Metal-Bonded Crowns – Also known as Metal-Ceramic Crowns. These are crowns which have white porcelain-fused to metal and are regularly used within NHS dentistry. Metal-Free Crowns – Also known as ‘white’ or ‘tooth-coloured’ crowns. These do not have any component of metal and are made from specialist materials such as zirconia, e-max, lava etc thereby allowing far superior aesthetics and can readily match the shine and translucency of natural teeth. Gold Crowns – available using real gold or alternative metals. A tooth that has been broken or damaged. For aesthetic reasons, patients looking to cover up any discoloured fillings. 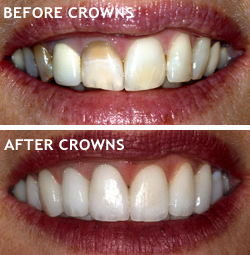 All crown treatments are available here at Govan Dental Care. They are affordable and it is a simple procedure. So if you are looking for any information view our videos here or to book an appointment for a consultation give our reception staff a phone on 0141 445 1829 or BOOK ONLINE and we will be happy to assist you!